And perhaps more relevant, I find explicating the brilliance of Yasujiro Ozu, a director I deeply admire, to be rather challenging; his simple-on-the-surface, emotionally pummeling narratives and impossibly steady and serene formal control are best experienced, not read about. Complicating matters even further is the fact that Tokyo Story doesn't quite seem like Ozu's supreme masterpiece to me — it's gorgeous and deeply moving, absolutely, but at times, it can feel a little airless and overdetermined, the obvious flaws of less sympathetic characters clearly mirroring the perfectly virtuous traits of others. When retired couple Shukichi and Tomi Hirayama (Chishu Ryu and Chieko Higashiyama) visit their grown children in Tokyo, they're met with a range of less-than-welcoming reactions, from the indifference of pediatrician son Koichi (So Yamamura) to the nearly shrewish hostility of hairdresser daughter Shige (Haruko Sugimura). Only daughter-in-law Noriko (Setsuko Hara), the widow of their son who died in WWII, displays any real grace or affection, taking time off work to spend time with them and treating them as if they were her own parents. The specter of war still hangs heavily over a rapidly shifting Japanese culture, and even if some of his characterizations seem a little broad, Ozu captures the melancholy that accompanies change with exquisite acuity. The Hirayamas might seem a little overly virtuous — their placid, pleasant reactions to being shuffled around by their put-out kids a little too understanding — but along with the tone of the film, there's no mistaking the concealed disappointment that hides behind the martyr-like facade. The film's downbeat final section isn't played as tragedy or irony so much as it is the inevitability of life, where sadness and disappointment are essential components to the human experience. That Ozu is able to bring this idea into coexistence with an appreciation of the small beauties in life is a testament to his mastery. Looking at it that way, the character difficulties of the film grow much dimmer. Criterion presents Tokyo Story in a 1080p high definition transfer in the film's original 1.33:1 aspect ratio. Ozu's films tend to look a little rough these days, even those that have made it to Blu-ray, which makes this exceptionally clean transfer such a surprise. The clean-up work on the 4K restoration the disc is sourced from is incredibly thorough, limiting damage and scratches to just minor occurrences here and there. Fine detail is present in every shot and the film-like appearance of the transfer is very appealing. The uncompressed mono soundtrack has some crackling, but it's pretty clean and certainly intelligible throughout. Everything from the 2003 DVD release is ported over, including an audio commentary from scholar David Desser, a two-hour documentary on Ozu and his career and a piece from 1993 where directors like Claire Denis and Wim Wenders express their appreciation for Ozu. Newly added is a documentary on Ozu regular Chishu and the history of Shochiku's Ofuna Studios. The disc also includes a theatrical trailer and the package includes a booklet with an essay by David Bordwell. Being that this is one of the first of Criterion's new dual-format releases, two DVD discs with all of the same content are also included. 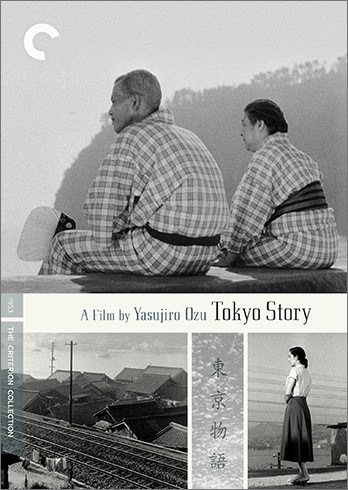 I look forward to revisiting this gorgeous edition of Tokyo Story many times over the years, and I wouldn't be too surprised if my admiration blooms into outright love.